March's update not only brought you one of our usual Buchschmid and Gretaux features on page 24 of this series, we also have a bonus page for this month which we hope you will find very useful. 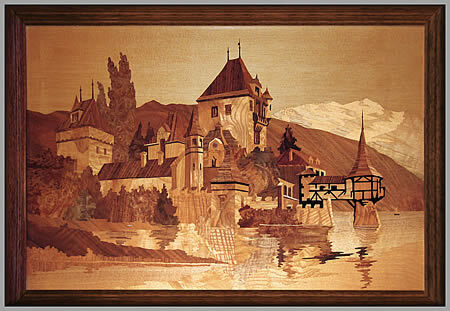 This page will help you with identifying the individuality that comes with each and every Buchschmid and Gretaux wood inlay picture. Even though several pictures may have come from the same cutting pack, by the very nature of the materials, each picture will be an individual. 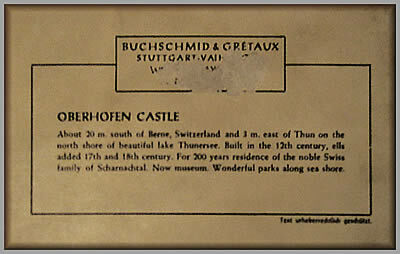 This March 2010 update brings you a very special treat, in that we are going to show you some examples of the differences you can, and will, find in Buchschmid and Gretaux wood inlay pictures of identical titles. You will note that, although the pictures are the same in both of these examples we are displaying on this page, there are odd subtle but visible differences between each of the two examples here from each title. 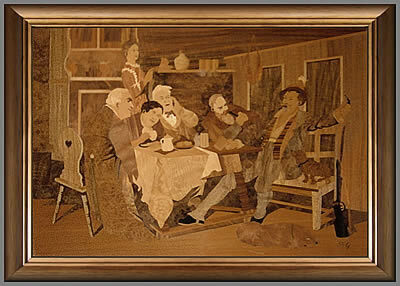 The differences are not so much in the layout or design of the pictures, they are primarily to be found in the figuring and grain pattern of the very material and medium of the veneer itself. It is a simple fact of Nature that no two veneer samples are exactly the same - they are not 100% identical. This is somewhat akin to human finger prints in that everyone owns their own unique set of finger prints. Well, this same principle applies to veneers - it is virtually impossible to get a perfect match - even in Book Matched examples of pairs (mirrored examples) or quartered sets, the chances of getting a 100% match just do not happen - a compromise has to be struck somewhere. Mind you, the compromises can be so extremely close in practice that it is near enough perfect for all intents and purposes. 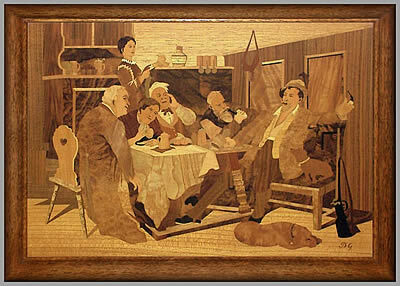 But, even with that said, there is nonetheless a uniqueness of some characteristic or other in every single piece of veneer. 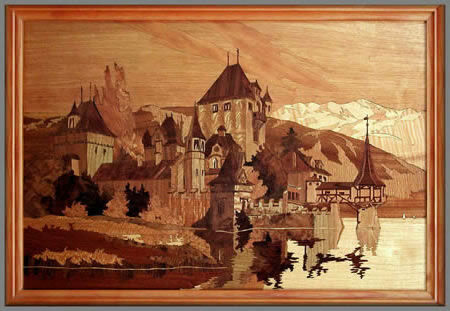 And, it is this very uniqueness that makes each and every Buchschmid and Gretaux wood inlay picture slightly different and individual from its sibling, even though they may been cut from the very same "veneer pack". These veneer differences are rather well defined in the lower pair of pictures "Good Friends". You will note the dark Walnut burr (burl) used on the shelf behind the serving girl (on her left) - and you will see two beer steins quite clearly visible in top or 'new copy' of the picture. Now, take a look at the same shelf in the lower version of the same picture. The Walnut burr has been used again, but this piece of Walnut burr is either a shade lighter or it has a different reflective quality to the same piece in the top picture. Whatever way, the shelf and its contents present a different appearance in both pictures - even though, as it seems with these two - they did appear to come from the same cutting pack. It cannot really be said that one example is any better than the other, each has their own unique quality derived from the glorious pattern of the veneer grain and figuring to commend it. A good point to note from all this, is that, as long as you have a good quality photo of your B & G wood inlay picture; if it ever goes missing you can always identify it easily if it is presented to you at an identity parade! "Descriptive Label from Reverse of above Picture"
Click the above button to return to page 24 of "Can You Help"